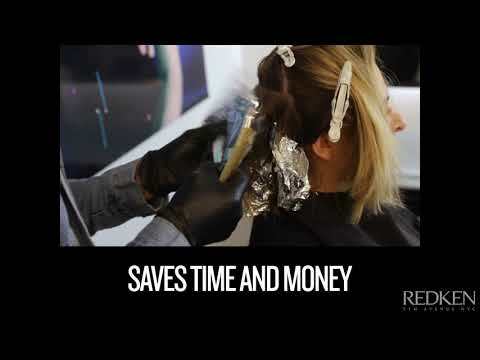 Buy 1 Redken Lightener or pH-Bonder* product and get 1 for 50% OFF! Must add both items to cart to qualify. A lightening powder that has a bonder built in, helping you protect bonds to keep fibers strong with none of the extra steps! Flash Lift Bonder Inside provides up to 8 levels of lift, protects bonds, and can be used with Shades EQ Gloss to customize clients' blondes. • Flash Lift Bonder Inside will give you the same lifting performance as Flash Lift, with he added benefit of having a bonding additive built in. • New customized packaging designed with a built in measuring cup. Flash Lift Bonder Inside mixes in a variable ratio of 1:1 to 1:2 for optimal consistency for a variety of applications. - Ratio from 1:1 to 1:2 depending on desired consistency. - Up to 50 minutes determined according to the desired results or until the hair reaches pale yellow. - Do not use heat. Blonde Idol Flash Lift Bonder Inside is rated 4.9 out of 5 by 116. Rated 4 out of 5 by Hairbychelsee from Good lift No complaints I Would just recommend bumping up the developer for lifting color. Have noticed less to no damage with the bonder inside! Rated 4 out of 5 by KimAH from So far so good Not a fan of the bag, it's very messy. Pouring it into an old flash lift tub. The consistency is a bit too thick, adding 1/2 oz more developer seems to be working, with a bit more warmth. Just having to let it process a little longer. Rated 4 out of 5 by Kreds from Lightner This Lightner gets supper thick and dry as it sits. Leaves hair in nice condition. Rated 5 out of 5 by jennifer from No extra step for PH Bonder I love this new product. Save time with the PH bonder added already. I’m still on the fence about packaging, a love and hate relationship. I feel the lifting power is still there. Rated 5 out of 5 by Anonymous from Great bleach This is a great product! Loving the integrity of the hair after using this product . Rated 5 out of 5 by Cindykshep from Better than ever! I can’t believe how much I’m loving this! It lifts beautifully and mixes o a creamy luxurious texture. I. Ant get enough of it and having been loving my balayages and foils even more than ever! Thank you for making this product! Rated 5 out of 5 by Stylist from best lightener ever I love the results I can get with this product. With the bonder already in it it is one less step.